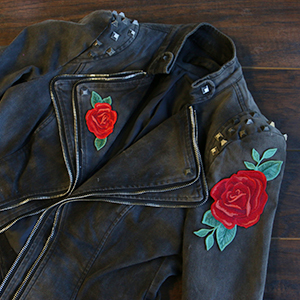 Add blossoming accents to your jackets, denim, and more -- without ripping any seams! 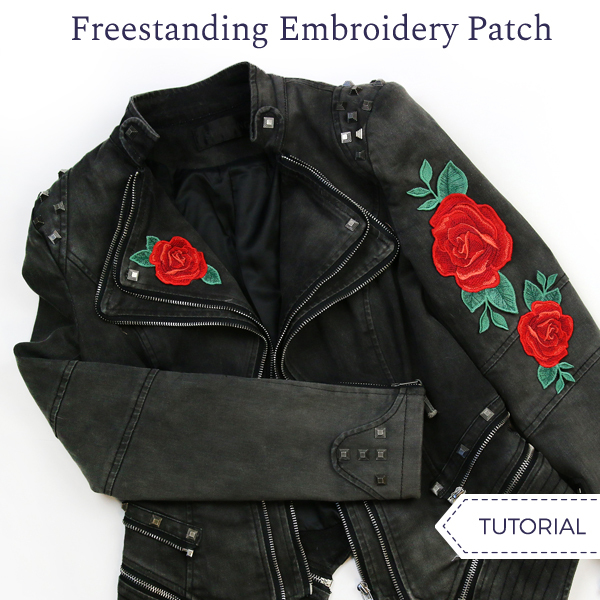 Follow these step-by-step instructions for attaching a freestanding embroidery patch to your projects. 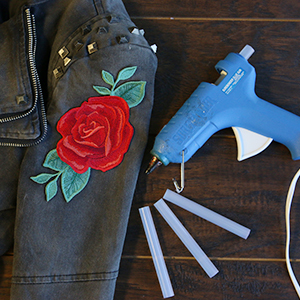 One way to adhere patches is with a hot glue gun or permanent craft glue. 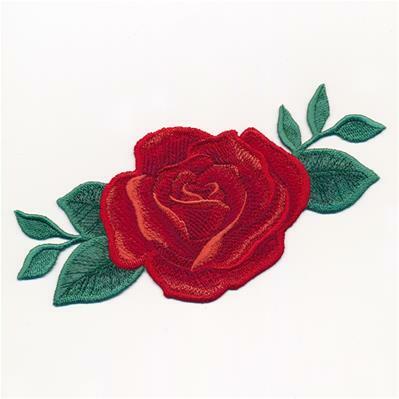 Start by stitching your freestanding patch onto heavy-duty water soluble stabilizer, then rinse to leave only the stitches. 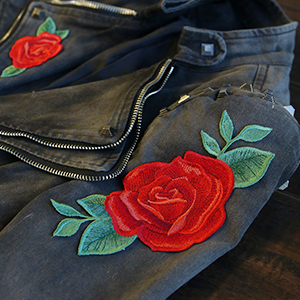 Once this is completely dry, spread glue across the back side of the patch and place as desired onto your jacket or bag. Apply firm pressure to adhere. Let the glue dry completely before wearing the jacket or using the bag. If using a patch glue, make sure to follow the instructions on the packaging. Some require ironing the patch to melt the glue and adhere the patch. For this type of adhesive, spread the back side of the patch with glue and place it on your project. 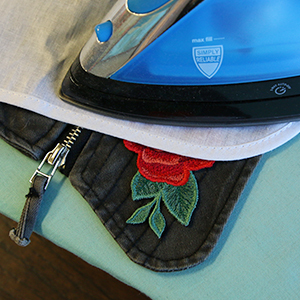 Next, lay an ironing cloth over the patch and iron until the glue is completely heated. Allow the glue to cool overnight before testing to see how well it stuck. A sheet of fusible web or insta-bond can also be used. Simply follow the instructions on the packaging to apply the fusible web onto the back of the patch. Place the design onto your jacket or bag and adhere it to your project. If using one of the adhesive methods above, sewing around the edges of the patch can help the patch to stay on and last longer. Simply tack a few stitches using and hand sewing needle and thread around the outside of the design, or sew along the edges with a straight or zigzag stitch on a sewing machine. If you choose to sew the patch on to your jacket or bag it is possible to not use glue at all. Simply place it where you would like and hand or machine sew around the edges of the design. 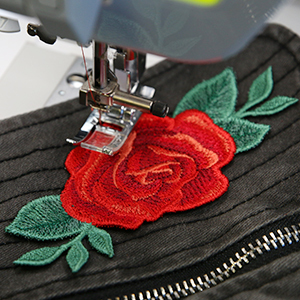 A straight stitch or a zigzag stitch can be used on the machine. 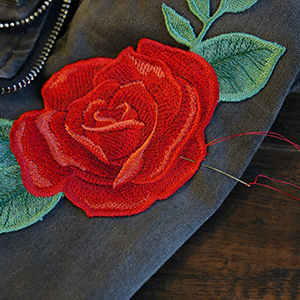 For best results, match the thread color to the embroidery.